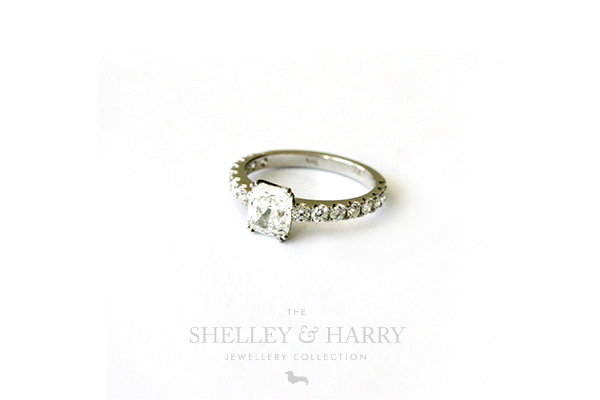 One of my favourite cuts of a diamond is the cushion cut. 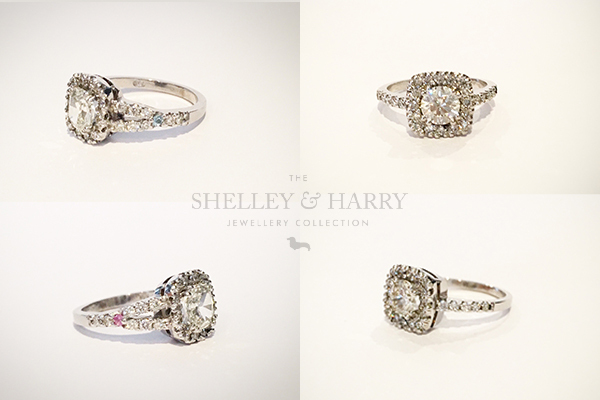 It is such a beautiful shape for an engagement ring don’t you think? Meg’s Ring – (on the right of the image) Here the cushion cut stone is set with four claws and diamonds on the band. It’s a classic ring and what a beautiful diamond! Lauren’s Ring -(on the left of the image) This is a cushion cut stone with a halo of diamonds and a split diamond shank/band. 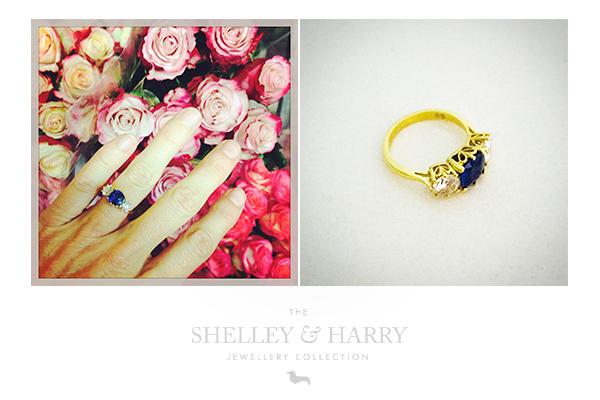 What a special ring, the blue and pink sapphires on the band represent the bride-to-be’s late parents. Angie’s Ring – This ring is a clever illusion and not technically cushion cut. It is a round stone set in four double claws to give the appearance of cushion shape, while the halo of diamonds in a cushion shape enhance this illusion. This ring is completely different. Still an engagement ring, but the centre stone is a cushion cut sapphire, it is flanked by 2 round diamonds and set in yellow gold. This ring is very much designed around the centre stone which was chosen first and the design and size of the other stones developed from there. Created to have the look of an antique ring, the yellow gold is a great choice as it brings out the colour of the sapphire, however it would work equally well in white gold or platinum for someone who doesn’t wear yellow gold. Cushion cut stones are all cut slightly differently, so it is important to take the time and do the research in order to find the right one. Some cushion cut stones are proportioned like a square while some are much more rectangular. Others have sharper corners and some are cut much deeper than others. It is important to know what you are looking at and be aware of the potential flaws which is why Shelley will be available to guide you through the selection and to point out the positive traits of a stone as well as any potential concerns. This entry was posted in Blog, Uncategorized and tagged bespoke jewellery, cushion cut, cushion cut engagement rings, Diamonds, engagement rings by shadmin. Bookmark the permalink.